Dr. Eric M Spencer, MD is a Doctor primarily located in Yonkers, NY. He has 21 years of experience. His specialties include Orthopaedic Surgery and Surgery of the Hand. He speaks English. Dr. Spencer has received 4 awards. The overall average patient rating of Dr. Eric M Spencer is Great. Dr. Eric M Spencer has been rated by 30 patients. From those 30 patients 14 of those left a comment along with their rating. The overall rating for Dr. Eric M Spencer is 3.7 of 5.0 stars. I find Dr. Spencer to be a very caring doctor, one who listens, explains medical condition, your options and lets you think it over before discussing it with you. This gives the patient time to think, review, discuss and then decide what’s best for them. Not often do you find a Doctor who does that. Many times their opinion is the only one that matters. WRONG. Dr. Spencer spent more time in displaying his (clearly VERY expensive) fine leather shoes and mentioneing his sports car, than in treating my condition. He does not belong in an office treating patients, but rather a cocktail party boasting of his possessions! Find a Dr. who concentrates on patients--not the fancy toys we're financing. I do NOT recommend this "Dr.". First appointment, he forgot about me. The office was closing and lights were going off. I had to let them know I had not been seen. Second appointment for a different injury, he was in a hurry and dismissive of my complaint of hearing a popping sound when playing tennis and unable to put weight on my heel. No x-ray but told me to come back in a two weeks if I was still in pain. The pain got worst, but i went to a podiatrist instead, who sent me for a sonogram and saw that I had torn my plantar fascia across the three bundles. I was placed in a boot for 3 months. On a third appointment for yet another injury, I was very hesitant in seeing him. He was again in a hurry. I had to quickly tell him my symptoms and after giving his diagnosis, I had to quickly ask questions because he was already heading out the door. He does not take his time with his patients, or at least, this patient. During each visit I felt rushed. He is in a hurry and makes feel like I am wasting his time asking questions. I leave feeling frustrated because the problem does not get resolved. Do not expect any care or concern from this doctor. He is purely mechanical and doesn't even return calls to patients. I went to Dr. Spencer when I had problems with my wrist after my pregnancy. He fixed that with a cortisone shot and have had no issues with my wrist again. Saw him again a few years later when I fractured my foot. Followed his treatment plan and my foot is all better. He has a great bedside manner, answers my questions and genuinely cares about his patients. Would highly recommend him! 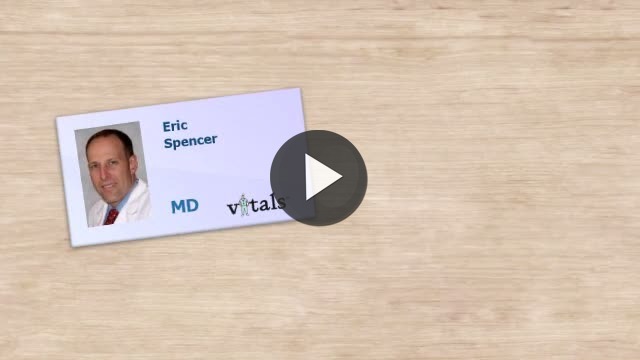 Take a minute to learn about Dr. Eric M Spencer, MD - Orthopaedic Surgery in Yonkers, NY, in this video. Dr. Eric M Spencer is similar to the following 4 Doctors near Yonkers, NY. Have you had a recent visit with Dr. Eric M Spencer? Select a star to let us know how it was.